• Roundtrip Amtrak Coach seat travel. must be paid in full when confirmed. • Hotel porterage, bellman gratuities & taxes. Tahoe on an 8-hour tour including lunch. • Assistance of a Tour Host. check your one (1) piece of luggage (per person) at this time, (50 lb. maximum). Free parking at the Cleveland Amtrak Station, lot is unattended so parking is at your own risk. • Depart: @ 2:59 AM Train #29 "The Capitol Limited"
• Depart: @ 5:22 AM Toledo Central Union Station. Lake Tahoe. Return to Harrahs Reno Hotel at 5:00 PM. historic vehicles are on display from the late 19th Century and throughout the 20th Century. catch a minor league baseball game of the Reno Aces. excellent alternative for exploring by car. Car rental reservations should be made in advance. 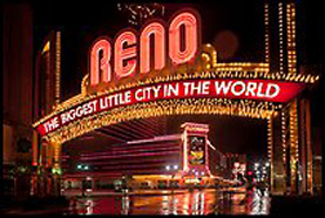 hotel rooms and delivered to Reno Amtrak Station by hotel personnel. All group members shall meet at the Reno Amtrak Station by 2:30 PM. On Board Train #6: Salt Lake City, Grand Junction, Glenwood Springs. • Arrive @ 02:50 PM Chicago Union Station. • Depart @ 06:40 PM Train #30 "The Capitol Limited"
• Arrive @ 11:39 PM Toledo Central Union Station. result of traveling to higher elevation areas. A deposit of $250.00 per person is required to sign up. Final payment must be in our office no later than May 10, 2019. RESERVATIONS ARE ON A FIRST COME/FIRST SERVE BASIS. The following fees apply when A to Z Travel Center receives a written notice of cancellation. Greater than 89 days prior = 20% penalty per guest. * 89-45 days prior = 25% penalty per guest * 44 -21 days prior = 50% penalty per guest. Trip cancellation insurance is available for a small fee. Click here for details. 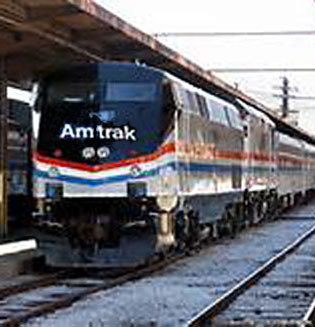 "Amtrak Al" and Jim are members of the National Association of Railroad Passengers. lodging or other accommodation, food or beverage.